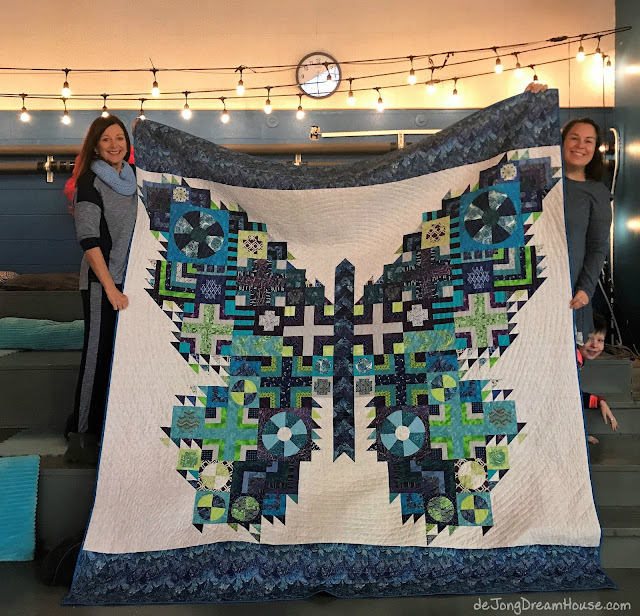 In November of 2016, I stumbled upon Soma of Whims and Fancies, who had the brilliant idea of hosting an online trunk show so bloggers can virtually display their quilts and other sewn items. 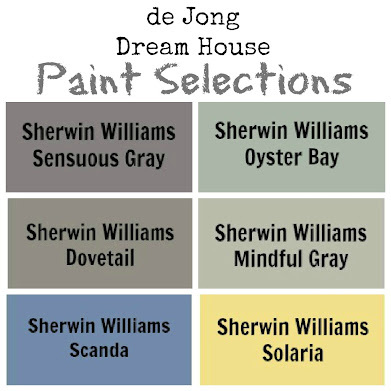 I put together a trunk show of my 2016 finishes, and now I'm going to get a start on my 2017 trunk show by posting photos and links to posts here. My first finish of the year was made for a little guy born the day (shy of eight years) before my son. Zeke was adopted by D's dance teacher at school and her husband. 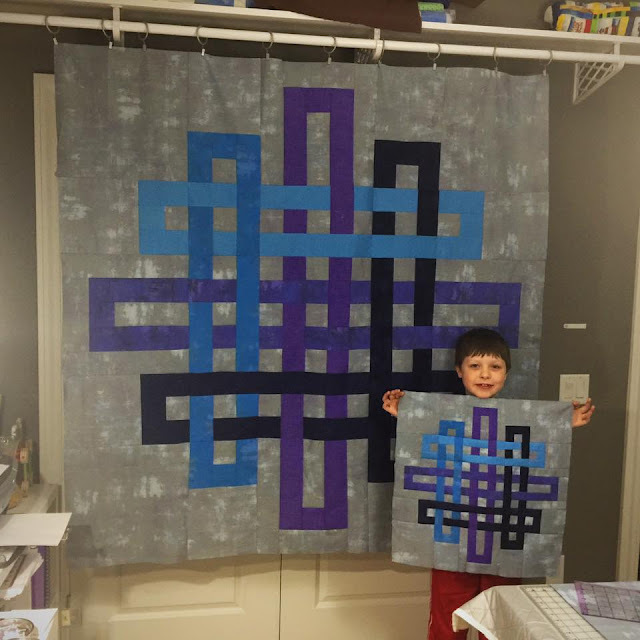 She has instilled a love for dance in my son I didn't think possible is such a science and math obsessed kid, so I had to make her a quilt! 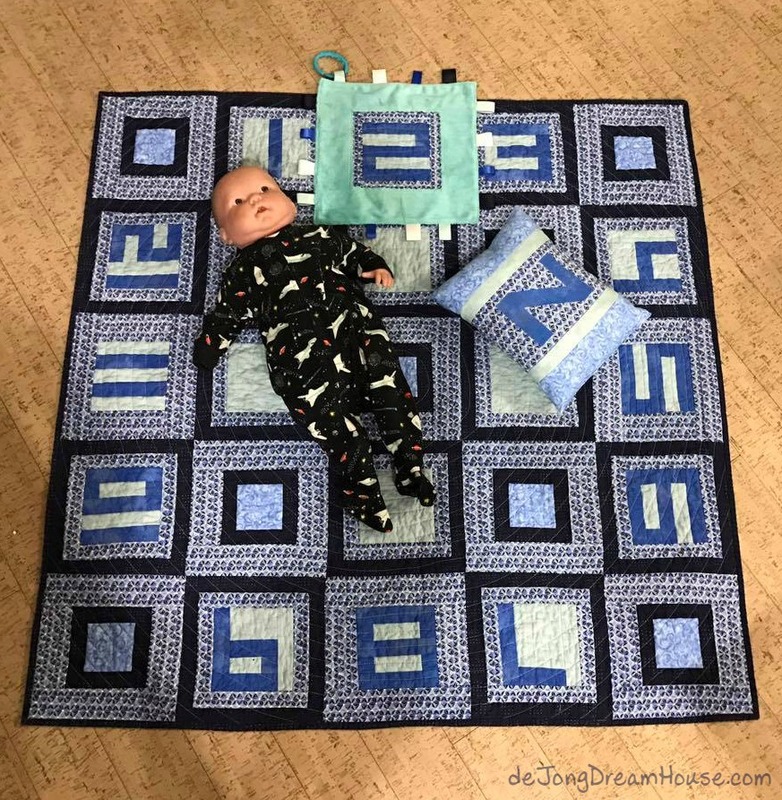 I had the idea of making a quilt that could be used for monthly photos, but the numbers were a perfect fit for someone who counts to eight all day! My second finish of the year is a charity quilt I was able to put together quickly for our church quilt ministry. I was able to use the Russian nesting doll fabric I bought before we went to Russian family camp. This quilt will be making it's way to an orphanage in Russian where I pray it will bring comfort and cheer to whoever claims it. So many people I know are having babies! I wish I could make quilts for all the little squishies! Alas, too many babies, too little time. When I found out that another teacher at D's school was having baby, I had the perfect opportunity to make a second milestone quilt. I tweaked it a little bit from the first one I made and I like this design even better. 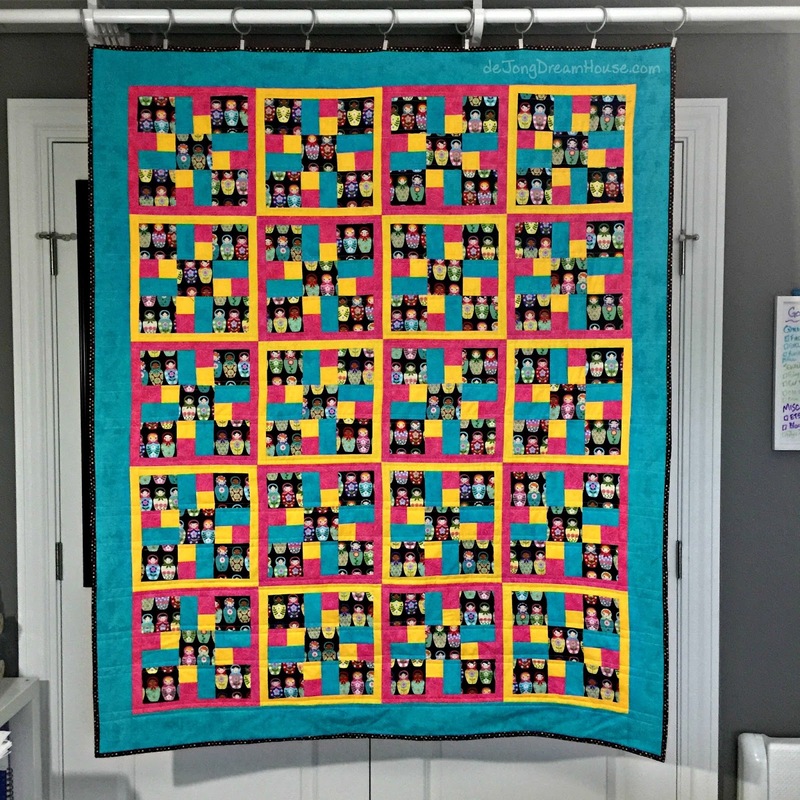 On the last day of February, I finished my first Bonnie Hunter mystery quilt. I started in November and kept up with the weekly clues until we went out West at Christmas time. I finished a little too late to make the finale link up, but I finished just in time to know that I needed to send this bit of cheer to a fellow December 08 mama, Angie, who, along with her girls A & A (aka, the A team) need something a little bright and cheery these days. 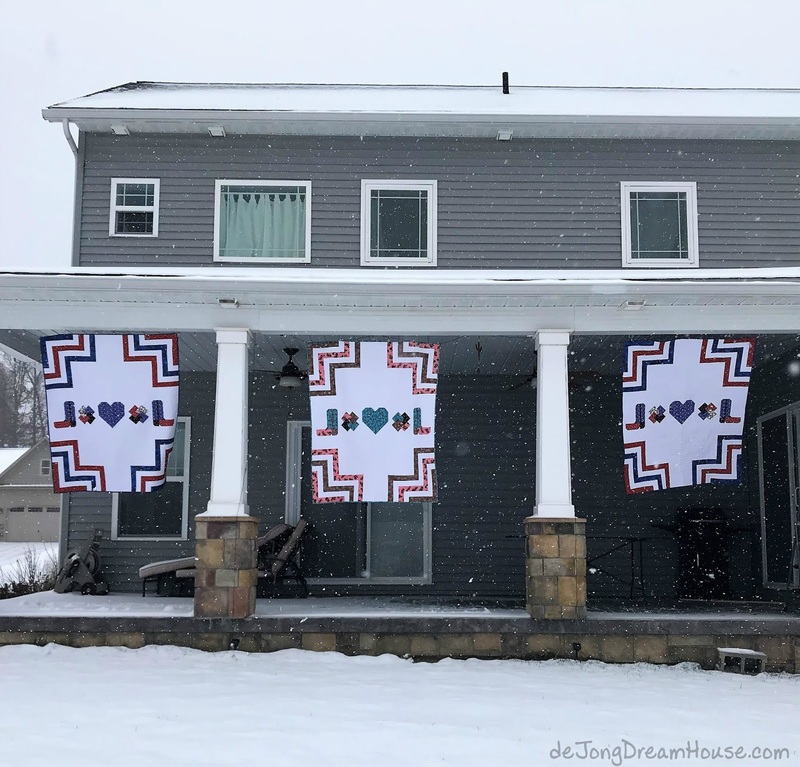 One of the things I most enjoy about quilt is connecting with other quilts. 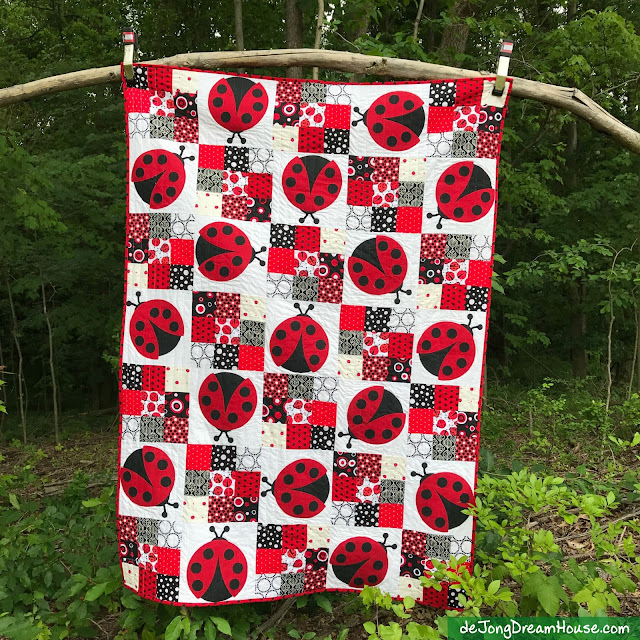 One of the first quilters I followed online before meeting in real life is Sarah Ruiz of Saroy.net. When Sarah put out the call for pattern testers, I quickly volunteered. Intertwined is my version of Sarah's pattern, which is now available for sale in her Craftsy shop. I made both the mini and the lap size quilt. I used the mini as part of the backing for the lap quilt, which I gifted to my friends Paul and Melissa. 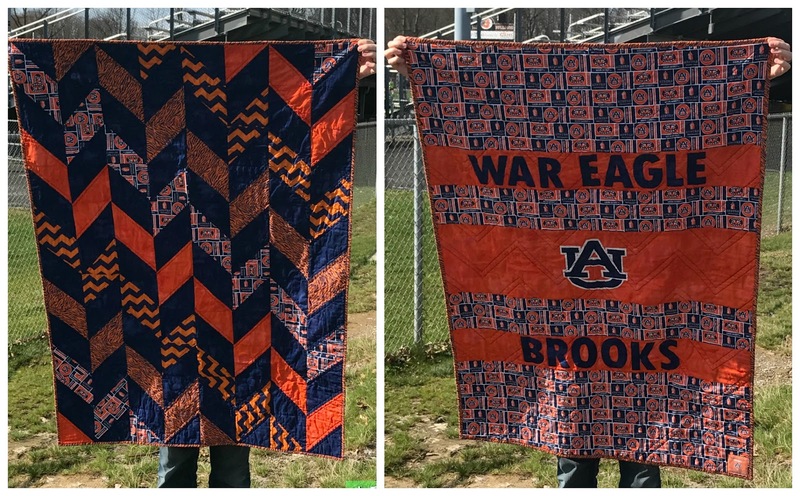 These two quilts came about when I was approached by the mom of one of D's classmates. Her mother had recently passed and she wondered if I could find a home for her quilting supplies. That's the kind of help I'm glad to provide. 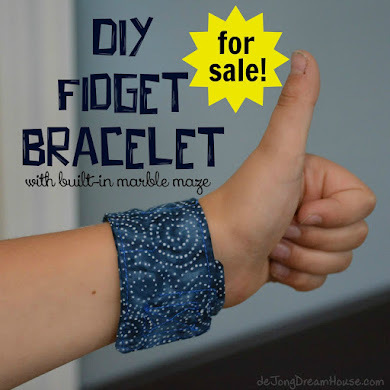 As I sorted through her boxes, I hoped to find enough fabric or a project in process that I could finish for the family. I hit the jackpot when I found 24 log cabin blocks. Best I can tell, she ran out of fabric to complete her original design and it was set aside. 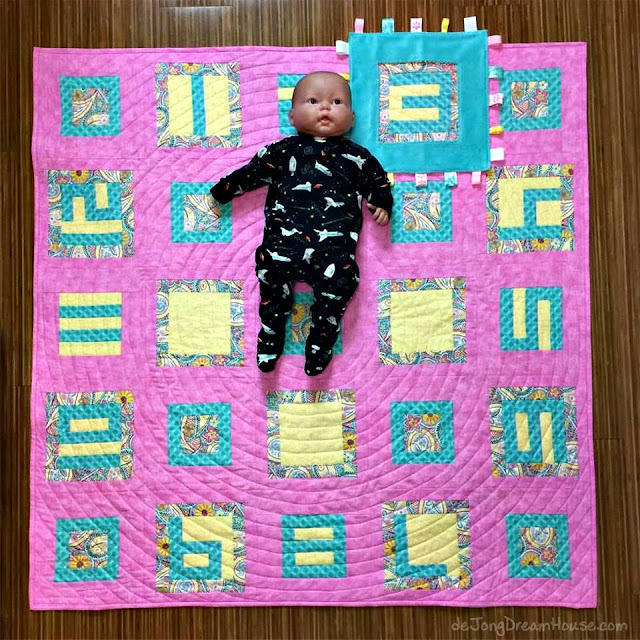 I was able to take apart the blocks, and reassemble them into two quilts for her grandchildren. I found enough fabric for the backing and to cobble together log cabin blocks for the back. 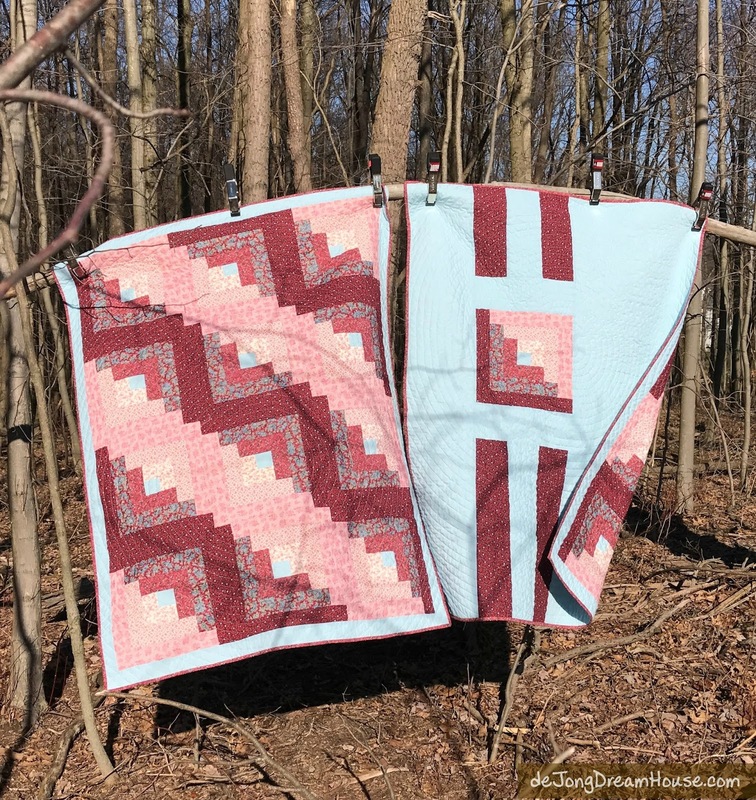 More than a few quilts have gone to fellow December 08 mamas. This quilt went the sweet little brother of one of D's birthday buddies. Brooks' mom and dad are big Auburn fans and alumni. 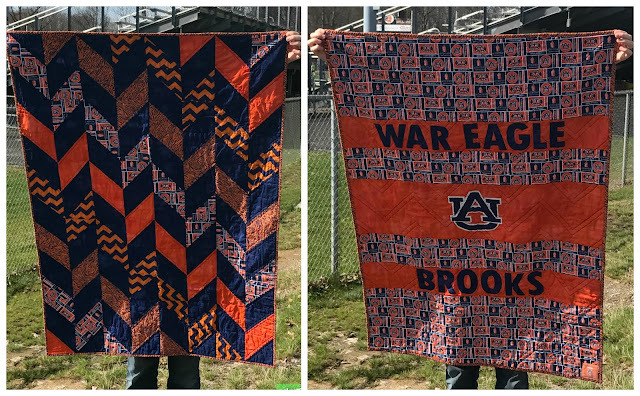 I knew that their quilt would feature Auburn colors and prints. 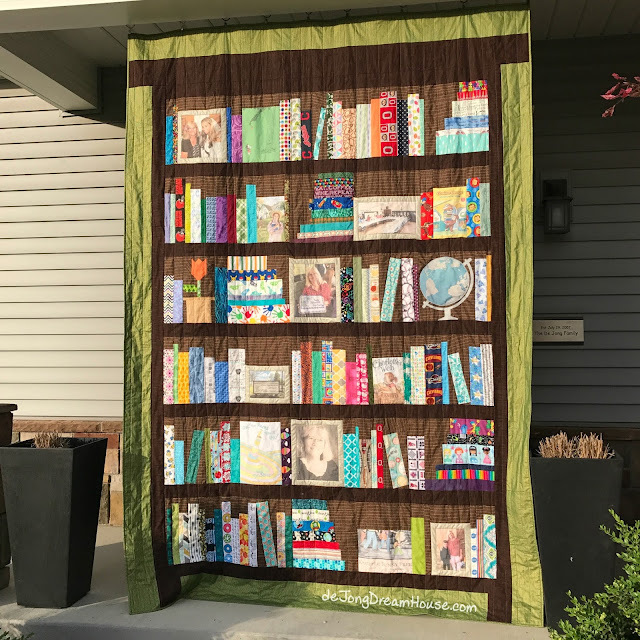 As an author and former publishing professional, I've wanted to make a library quilt for as long as I've been quilting. But it wasn't until I learned that our son's school librarian was retiring--in 17 days!--that I got motivated to make one. It is one of my favorites. I love putting all sorts of special touches into this one to make it special for someone we will miss seeing every day at school. In keeping with my tradition of delivering baby quilts long, long after baby's birth day, this quilt was a gift for my local friend Courtney to celebrate lots of good things that have come her way in the last few years, Particularly a sweet baby girl. With school out for the summer, my thoughts turned to our upcoming trip to the Netherlands to visit family. I am getting close to my goal of making one quilt for every one of my immediate family members. When I talked to my sister-in-love, Ingrid, about a quilt for her, she asked if I would make a quilt for a friend who has really stepped up to help her through some health issues. She asked that it have a Celtic theme, and that I use black and gray fabric. I modified this pattern from a perler bead template. Once I started Celtic Midnight, it went together very quickly. 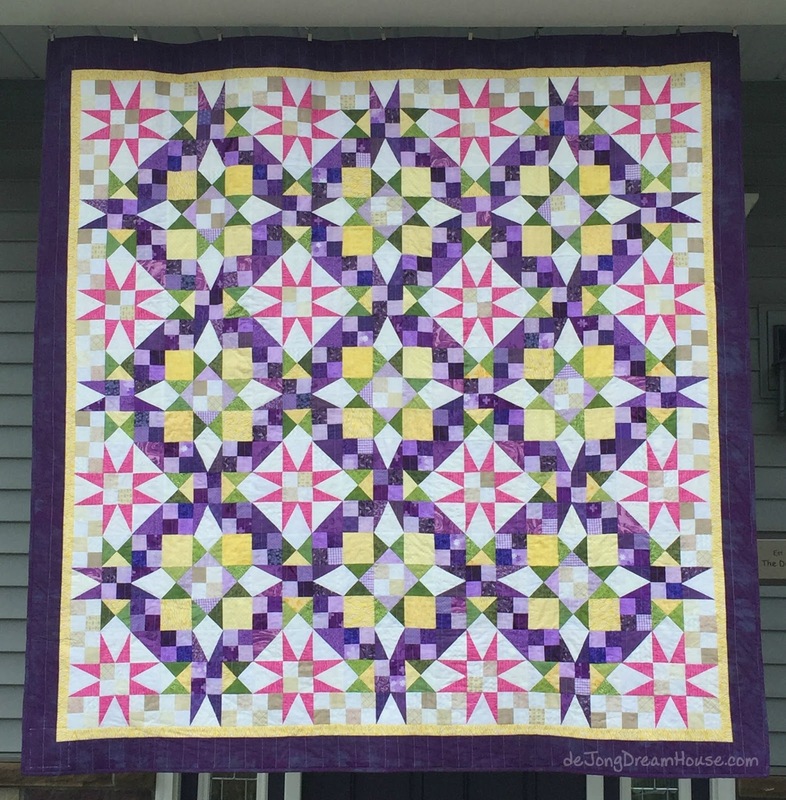 So fast that I still had time to make a quilt for my sister-in-love, Ingrid. I was playing around with making paper pieced patterns on EQ7 and came up with this pattern. 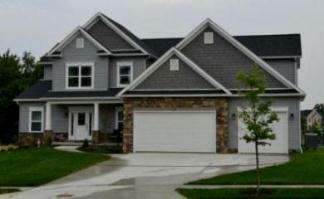 I like it so much I would have kept it if I would have kept it a secret and didn't tell Ingrid about it! 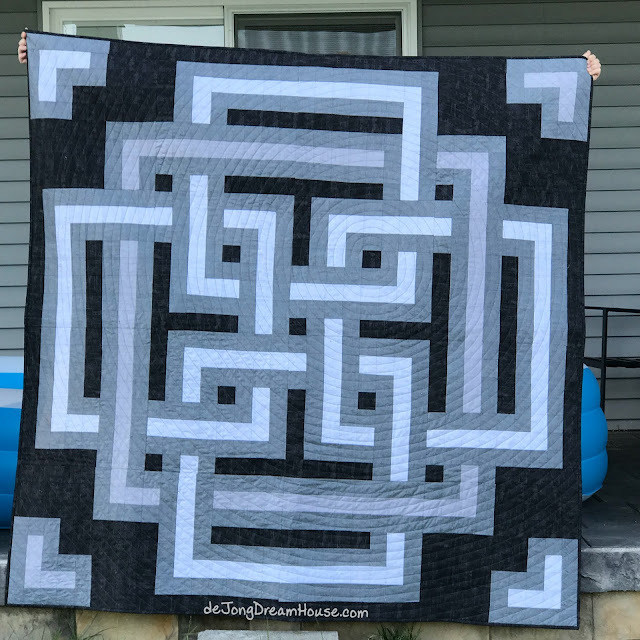 Sometimes quilts take longer than expected, and sometimes they stitch themselves. I made my niece, Lindsey a quilt a few years ago. In fact, it was the first true quilt--not a rag quilt--that I ever made. 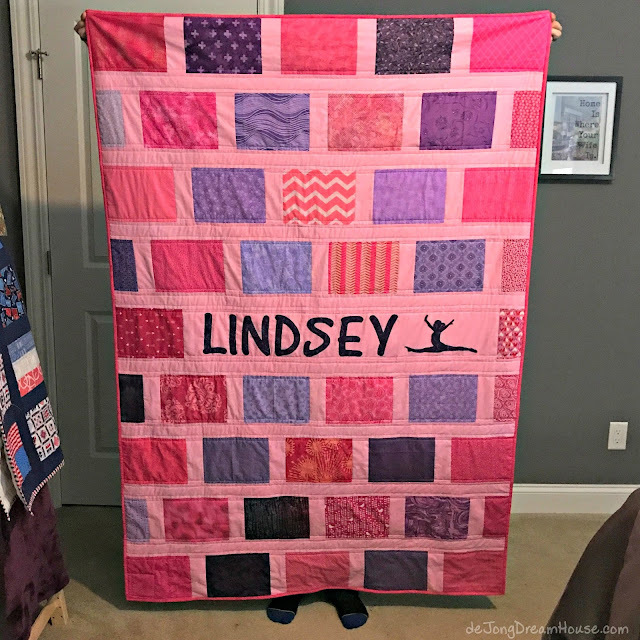 I've learned a lot since then, so I wanted to make her a new quilt, a big girl quilt that reflects her current obsession: gymnastics. Back in 1993, I was living in Des Moines, Iowa during the Great Flood. I was able to leave that disaster when I accepted my first job, just outside Houston, Texas. Seeing the devastation of Hurricane Harvey brought me right back to that scary, uncertain time. 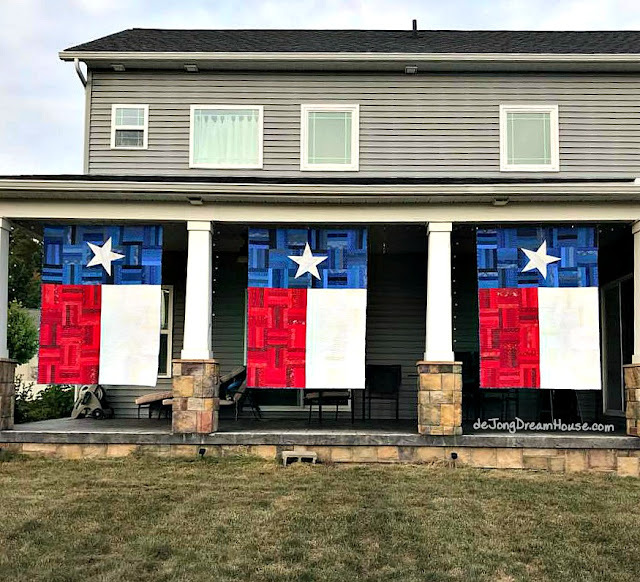 I teamed up with Quilts of Compassion by making these three Texas flag quilts for their hurricane relief deployment. I hope that they bring comfort to whoever receives them. In addition to the three Texas quilts, Hurricane Harvey prompted me to finish a quilt I started restoring a few years ago. 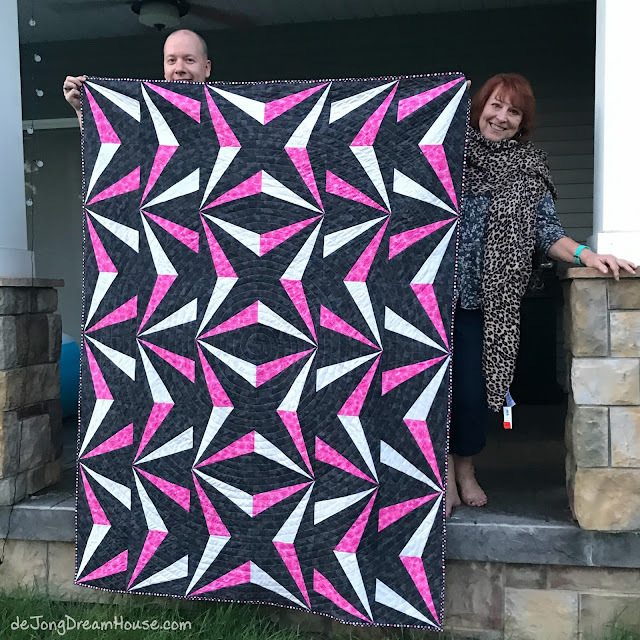 What I thought was a completed quilt top at a garage sale was actually a pieced collection of stained and ripped blocks. I was able to save the good blocks and make something new and beautiful. As I was working on it, I thought it was a beautiful metaphor for rebuilding after disaster. Stella's mom and I met at a local breastfeeding support group when our sons were babies. Over the years we have moved on to new circles, but have stayed in touch on Facebook. I was heartbroken to learn that her second child, a daughter named Stella, passed away of an unknown cause on her birthday. 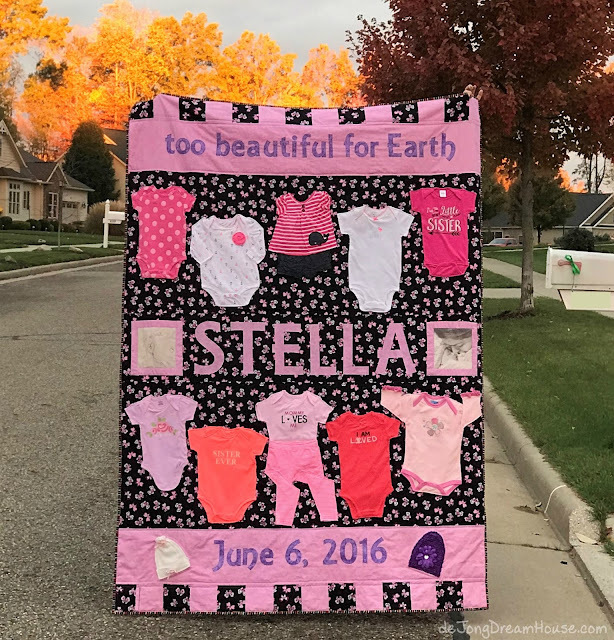 My friend was kind enough to give me some of Stella's clothes so I could make a memory quilt for Stella. I hope that it helps her feel close and connected to the daughter she misses so much. Back in my pre-quilting, pre-brain injury days, I was a marketing director for a publishing company. One of the first books I worked on was by a strong survivor named Renee Alton called Stumbling Toward Faith. Thanks to Facebook, we have kept in casual touch. 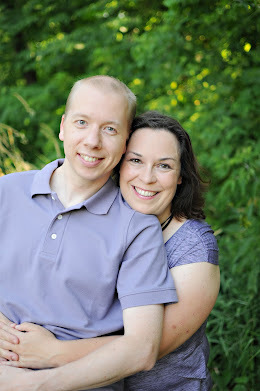 I was heartbroken when I learned that she was diagnosed with terminal colorectal cancer. 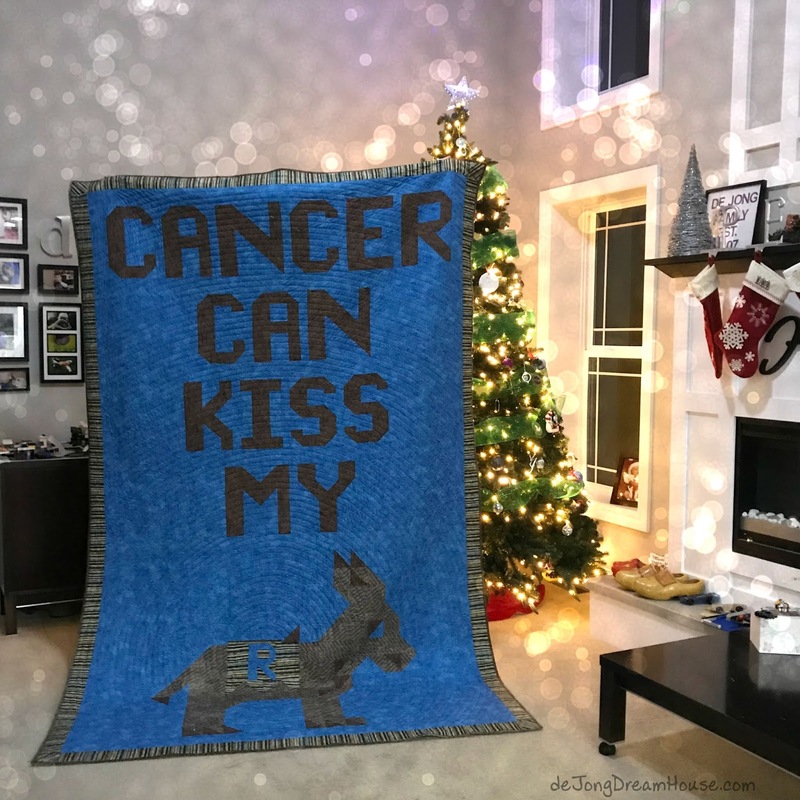 Renee has a sassy, quirky sense of humor so I made her this quilt. On October 1, 2017, our nation was once again victimized by a senseless act of terrorism when a man murdered 58 people and injured 851 others. 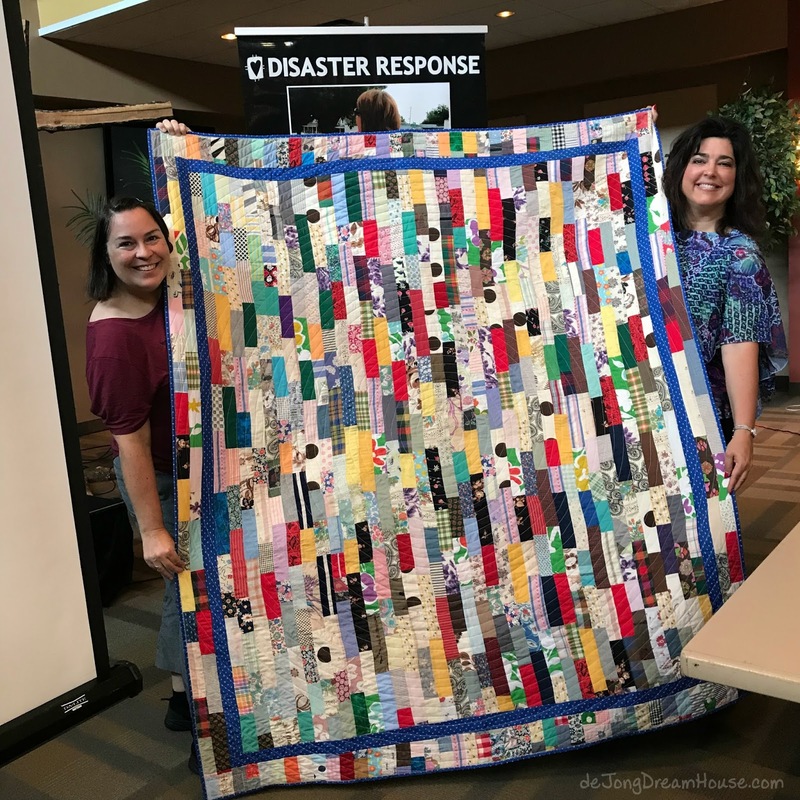 The Las Vegas Modern Quilt Guild organized a drive to collect quilts to distribute to survivors and family members of victims. These are my contributions. 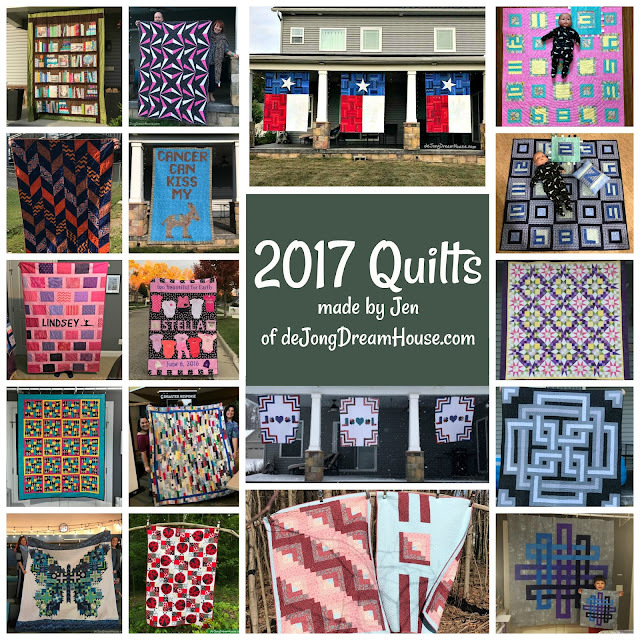 2017 has been a year for social quilting. Whether making quilts for special projects or participating in sew alongs, I have a had a lot of fabric under my needle this year. My Tula Pink Butterfly was part of a sew along with Gnome Angel. Sewing with others was the motivation I needed because this quilt was a stretch for me, particularly the curved piecing. But I love how it turned out and was so pleased to be able to gift it to someone who really stretches herself for the kids at my son's school.